During the period 16 Aug - 10 Sep 55, No. 1 (F) Wing was hit by a virulent attack of poliomyelitis. During the two weeks, there were 2 cases per week and after that the cases came more rapidly to reach a peak of four cases in one day. After this the epidemic subsided as rapidly and mysteriously as it had originated. The hospital staff was fortunate in having the facilities of the 7100th USAF Hospital at Weisbaden Germany. The first ten cases were transferred there to be cared for in the isolation unit. The first four cases were all children under the age of ten and these children were all the cases of that age group affected. It may be noted that no children that had Salk Vaccine developed polio. Precautionary measures were taken at station level and these included the closing of the swimming pool, restricting the theatre to adults and postponing the opening of school - other measures of an intercommand nature were originated at No. 1 Air Division Headaquarters. 4000 5cc vials of gamma globulin were requested from the DGMS (Air) Ottawa and the full consignment arrived within four days of the demand. Consequently it was possible to innoculate all service personnel, their dependents and civilians from the age of one year upwards. Close on 2000 people were given injections in a total time of approximately 9 hours. Twenty seven cases, and of these, in all there were some eleven had paralysis (including 2 cases of bulbar polio) and in two the paralysis was only transient. Six adults - five service personnel and one dependent - have had to be repatriated to Canada. Two of these, were airlifted in "iron lungs" to Vancouver, BC. This was carried out by a special USAF team who flew from the USA in suitably equipped aircraft. In retrospect, it may be said that the morale of 1 (F) Wing was magnicificent. There was no panic and this was largely due to an excellent leaflet prepared and distributed by the HQ staff. The hospital was most fortunate in having utter and complete co-operation from everyone concerned. Marville left a great deal to be desired when the RCAF accepted this location and moved in from North Luffenham in the spring of 1955. The station was commonly referred to as Mudville" and the number of "rats" (alive and dead) which were in the area was simply amazing. We could even hear the rats in the roof part of the barracks at night. A group of us fellows were sitting out in front of the barracks when we spotted a rat run by and went into the evestrough drain pipe. We banged on it to try and drive it out. One guy had the bright idea to pour a pail full of hot water in the rain gutter and when the rat came out 4 or 5 of us with sticks and stones would try to kill it. Sure enough the rat came out - ran like hell towards me, and right up my pant leg. I was lucky as I was not bitten but I jumped so damned high the rat fell out of my pants. That was when the fellows did him in. I was 22 then and now I am 70 but I shall never forget that indicent. Every morning when we would go to the washrooms to wash and shave the fellows would say that damn rat was over my room last night. I suppose it was inevitable that Polio would become a problem. The son of a personal friend was stricken with Polio and I remember this youngster trying to get around with braces on his legs that summer of 1955. Things were so bad thatn we had mass innoculations in the Drill Hall. Every night after supper time a Dakota used to come in to Marville to fly the days patients out for the trip to Canada. We had a pilot land his F-86 and they had to help him out of the Sabre because he couldn't move his legs. He was very lucky to get his airplane back on the ground in one piece. I should have realized the seriousness of this problem when my sister sent me a newspaper clipping from the Toronto Daily Star about the polio epidemic at Marville France. I was stationed at Edmonton, working in the hospital before I went to France. I went overseas on a Greek Line Ship called the Neptunia. It left from Montreal and it took seven terrible days to cross. The ships first stop was Cork in Ireland and no one got off. Then into Southampton in England where once again, no one got off. Then across to Le Havre in France. There must have benn between 150 and 200 service personnel on the ship. I recall that we travelled by bus to Paris where we stayed for a night, and then continued by bus the next day for Marville. I arrived at Marville in April 1955 as a Med A working at the Wing Hospital. The grounds on the station were terrible. There was mud every where along with open ditches filled with muddy water and very poor looking Arabs working around. The barracks, of course, had just been constructed so they were in good condition. The rooms were for either one or two people. We had a little pub in in the Airwomen's barracks which was open at night. In all - there may have been 75 girls on the station. The WD officer at that time was F/O Sheila Strange. There was a PX on the station and this facility had lots of great stuff at very good prices. The Rec Hall was well equipped and they even brought in entertainment such as singing groups, magic acts, etc. The hospital was very busy with dependents as well as service personnel. The nursery was busy with the birth of new babies. Besides the Nursing Sister, there were a number of civilian doctors and nurses. The SMO was Dr Blakeknox and the Nursing sister was F/L Seamore. As a rule, if you were diagnosed with anything very serious, you would be transferred to the hospital at 3 Wing. Most of the cleaning help and cooks were local French nationals. They didn't speak much English and we didn't speak much French. I recall that the hospital had about 30 beds. I was diagnosed with polio in early September of 1955 and was confined to the hospital barracks in Marville for a month. I don't know how I got polio. I was not working in the isolation barracks with the polio patients. I had just returned from a trip down to Rome and the south of France about a week or 10 days before I was diagnosed with polio. The polio epidemic was in full swing when we returned from our vacation trip. There were many rumors on the station as to what had caused the epidemic. One of these concerned the water in the PMQ area - which, according to rumor, was contaminated. The wards at the barracks were nothing more than barracks which were a part of the hospital and they were used, as required, for patients. There was one patient in each room. The nurses had to do all the cleaning such as washing the floors. Additional medical staff were brought in from the other Wings to help us out during the epidemic. We always had people from Canada and other places coming in and asking lots of questions on where we had been and what we did. I assume that these were mainly doctors and health officials. I recall that our food was brought in from the hospital. All the staff wore gowns, gloves, and masks. Dr Blakeknox was always around. He did spinal taps on me and many others. The lady (a civilian dependent) across the hall from me was in an iron lung. She was in very bad shape. She had polio in her lungs. Some of the patients were being moved to Canada. I didn't really know what to think when I was diagnosed with polio. I just accepted it was polio as that's what everyone said it was. I had a drop foot, and lower leg weakness, and also weakness in my left hand. I was transferred to the US Air Force hospital at Wiesbaden around the end of October. It was just a stop over to get me back to Canada. I was there about a week. Dr Blakeknox had taken us up there in a small plane. There was also a male Corporal that had polio and he was going back to Canada also. I only saw him when we were in transit. He walked with a cane. I couldn't walk and was on a stretcher. The next move was by ambulance to the US Army hospital at Landstuhl. We stayed two days at Landstuhl and then they loaded us on a large American Hospital aircraft for the trip to the United States. There must have been about 200 patients on this hospital aircraft. I was on a stretcher on one side of the plane with a stretcher below and one above. On the other side of the plane they had seats. Some patients were in restraints and seemed very violent. The aircraft proceeded to the Azores where we landed and everyone was offloaded for a period of about four hours. The next stop was Fort Dix in New Jersey. I spent a week in a hospital at Fort Dix and was eventually picked up by a Canadian ambulance with a nurse. I was initially driven to RCAF Station Lachine and I spent about a week at this location. 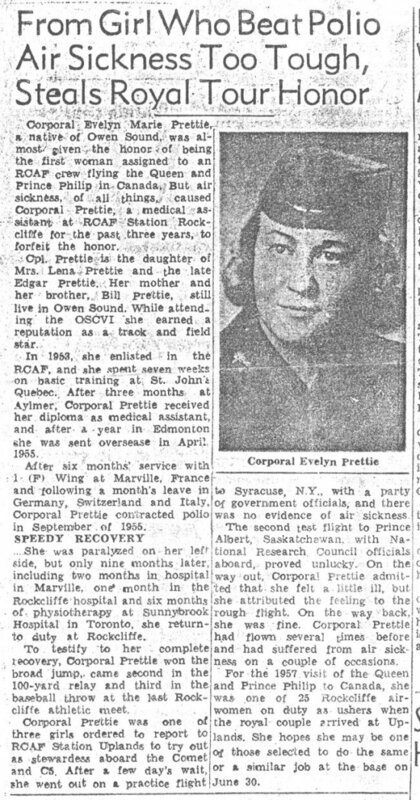 My next move was by ambulance to the hospital at RCAF Station Rockcliffe where I was introduced to more doctors and more physio. A month later, I was off to Sunnybrooke hospital in Toronto. I spent six months at Sunnybrooke, and I eventually returned to RCAF Station Rockcliffe around September of 1956. It had taken close to a year of my life to return reasonably close to the physical condition that I was in before I was diagnosed with polio. I was on part time duties for some time at Rockcliffe and I continued with my physio treatments. I eventually did get back to what I could call a normal life. I had a slight limp but I managed to get around pretty good. I eventually took my release (at Rockcliffe) in 1960 after seven years with the RCAF. Girl Beats Polio - 1957. Section News. 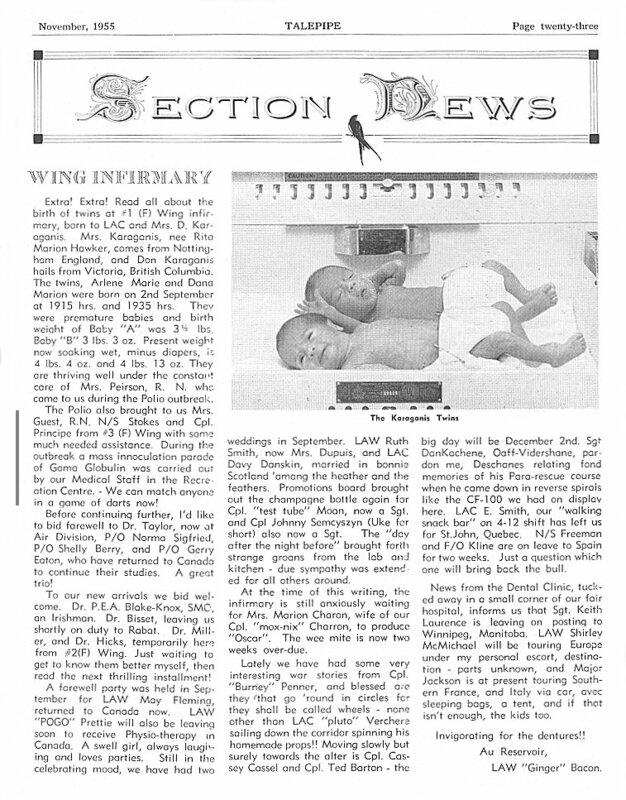 Wing Infirmary - November 1955. 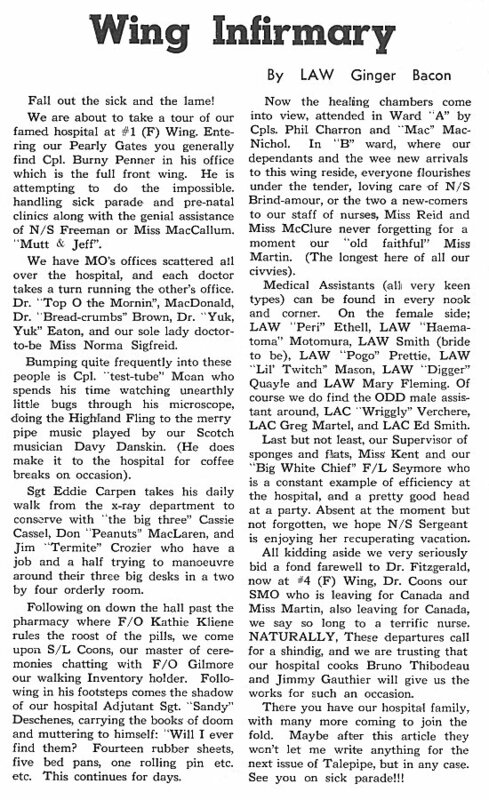 Extract from a 1 Wing Talepipe magazine dated November 1955. 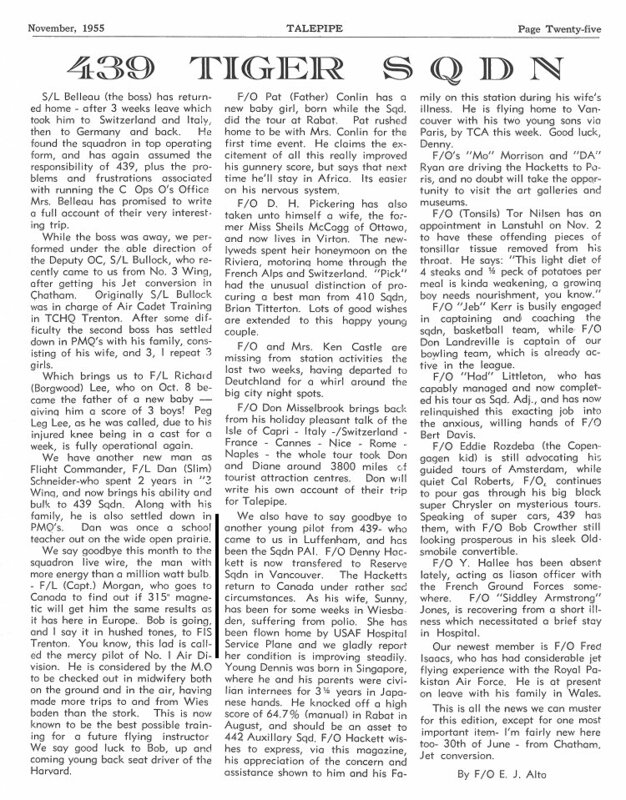 Section News- 439 Squadron - November 1955. Section News. Protestant Chapel - November 1955. 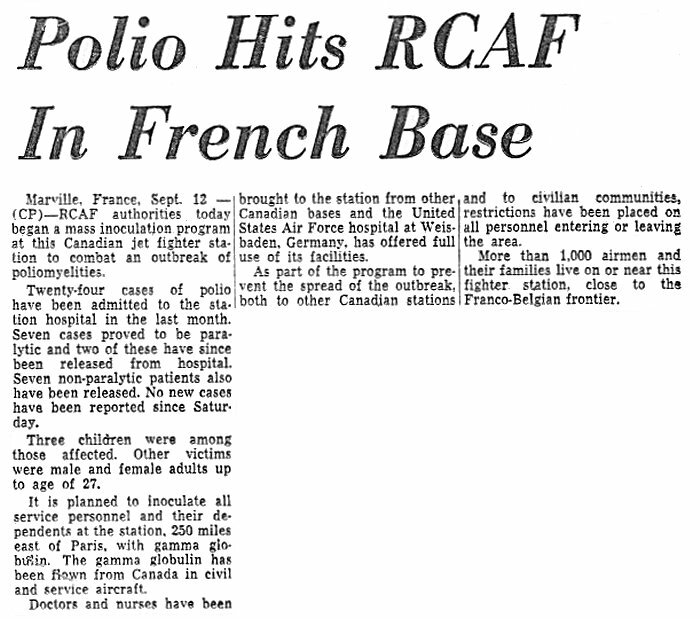 Polio Hits RCAF Base in France - 12 September 1955. 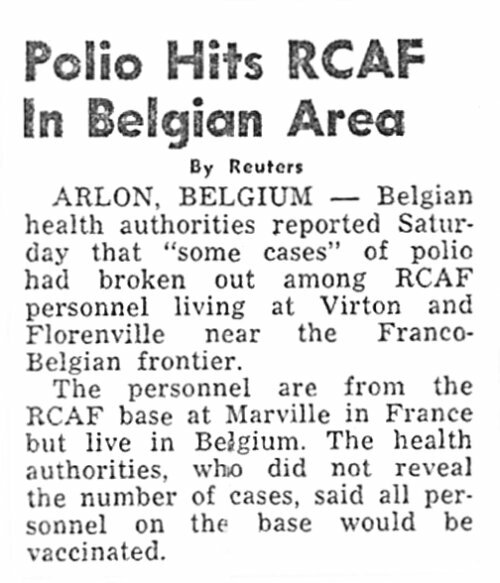 Polio Hits RCAF in Belgian Area - 12 September 1955. Rush Serum For Mass Inoculation - 12 September 1955. Polio Hits RCAF in French Base - 12 September 1955. Section News. Wing Infirmary - September 1955. 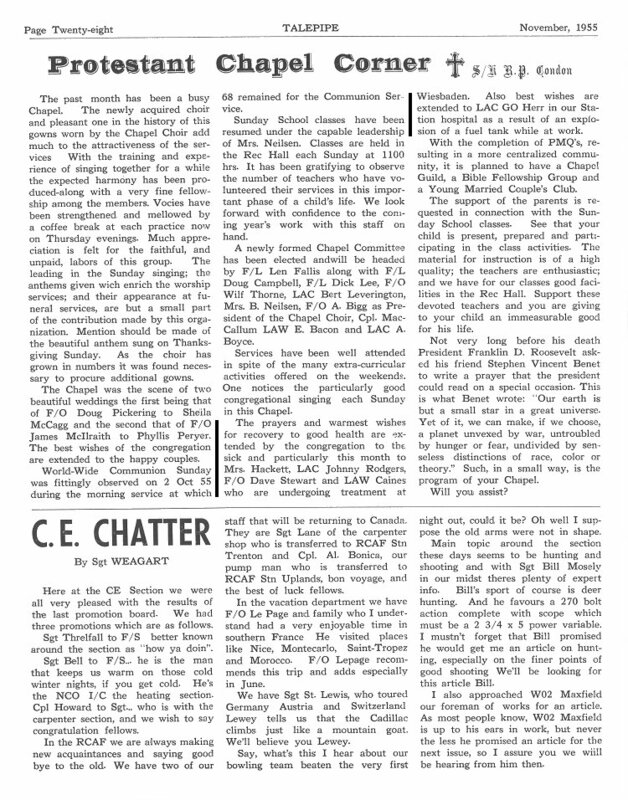 Extract from a 1 Wing Talepipe magazine dated September 1955.